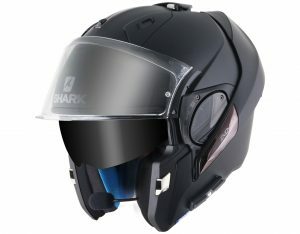 SHARK Helmets has introduced all-new SHARKTOOTH® PRIME – the evolution of the original SHARKTOOTH® – a universal, wireless communication and entertainment system to keep motorcyclists connected to their Bluetooth devices. So much more than just speakers and a microphone; the new SHARKTOOTH® PRIME has a number of functions set to make every ride more convenient. With SHARKTOOTH® PRIME, riders can listen to music, follow GPS instructions, make and receive calls or communicate with another rider or passenger by connecting to their universal intercom system. All features can be easily operated via the innovative two-button control panel, which fits on the outside of the helmet and is 100% waterproof. 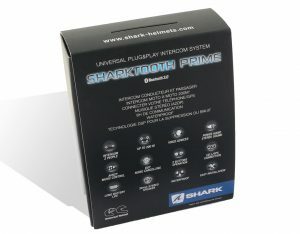 Internally, the SHARKTOOTH® PRIME comes with two high quality headphones, designed to be extra slim for optimal comfort, and with A2DP (Advanced Audio Distribution Profile) for stereo music. 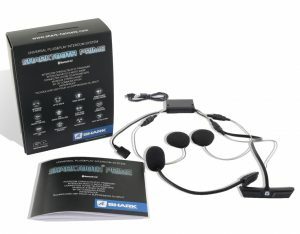 There is also a high-performance, swivel-arm microphone that provides top voice quality, along with background noise reduction. SHARK helmets displaying the “SHARKTOOTH® Ready” symbol have dedicated slots for installing the SHARKTOOTH® PRIME system components, meaning it can be seamlessly integrated into the helmet shell for maximum compatibility, easy installation and minimal disruption to helmet style. SHARKTOOTH® PRIME is ultra-lightweight at only 75g, so riders won’t get any additional neck tension. Riders can enjoy up to 8 hours of use* with the rechargeable battery, and the system comes with a 2-year warranty for peace of mind. SHARKTOOTH® PRIME is available in UK dealers now with an RRP of £109.99. To locate your nearest dealer, visit www.nevis.uk.com or call 01425 478936.